During a live Q&A on Tuesday, a college student asked Bill Gates what worries him at work. 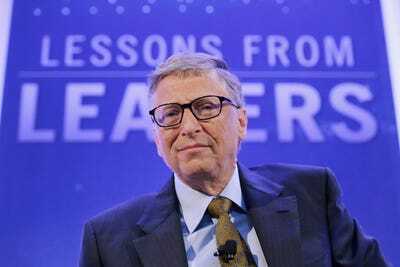 Gates admitted that juggling the non-engineering components of running a business – hiring, managing, accounting – has made him feel nervous in the past. He added that the Trump administration’s influence on the Gates Foundation’s work also gives him anxiety. Over the past four decades, Bill Gates has launched Microsoft, donated billions toward furthering global health, and become the second richest person on Earth. That’s an immense amount of responsibility and productivity for one person. Gates may seem relatively relaxed, but like the rest of us mere mortals, he also feels anxious at work sometimes. On Tuesday, during an interview at Hunter College in New York City, a student asked Gates about his worries and weaknesses at work. Gates added that communicating with government makes him anxious, too. In his latest letter discussing the Gates Foundation’s charity work, he wrote that President Trump’s “America First worldview” has made his team’s foreign aid projects more difficult. In March 2017, Gates visited Trump at the White House to have a conversation about the proposed budget cuts to the State Department and the US Agency for International Development. It’s a reminder that work-related anxiety is part of the human experience. And no one is immune to it- not even Bill Gates.